When The Legend of Korra: Book Two ended, Korra made a decision. 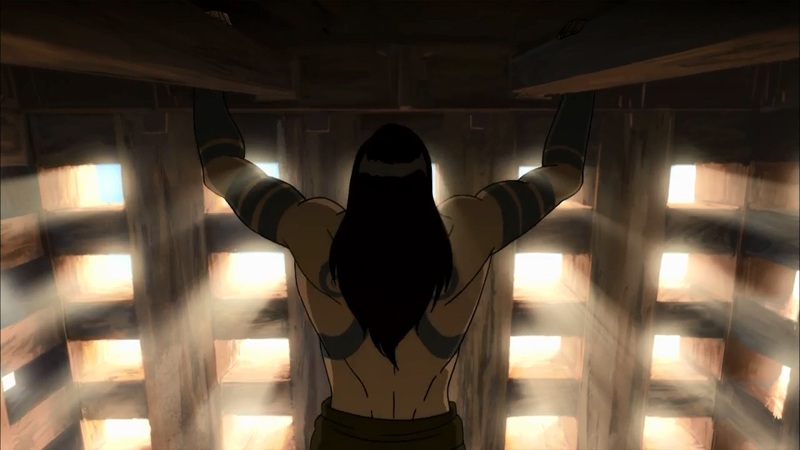 After ten thousand years of separation, Korra decided to leave the door between the mortal and spirit realms open during an event called Harmonic Convergence. 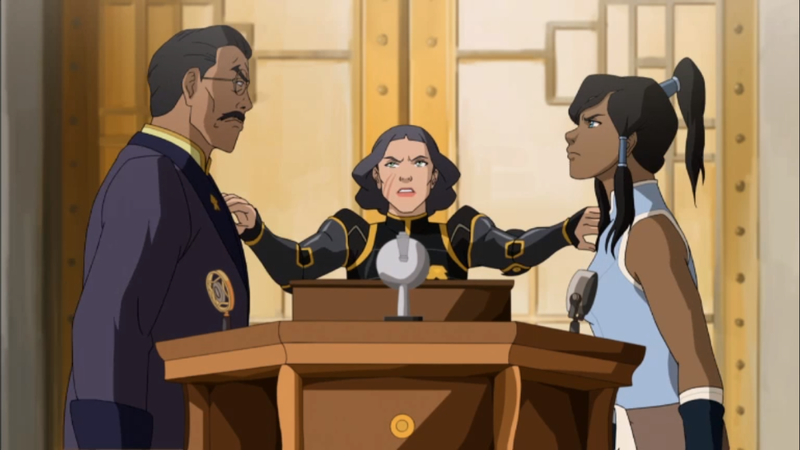 In the same series of events, Korra lost her connection to all the past Avatars. Being able to reach out to the past Avatars has always been a crucial aspect of both The Legend of Korra and Avatar: The Last Airbender. Aang and Korra, as well as all past Avatars, have received guidance and knowledge from communicating with their past lives. After Harmonic Convergence, Legend of Korra is changing course. Korra's decision has had an impact on the world and they will motivate her next steps in her journey. 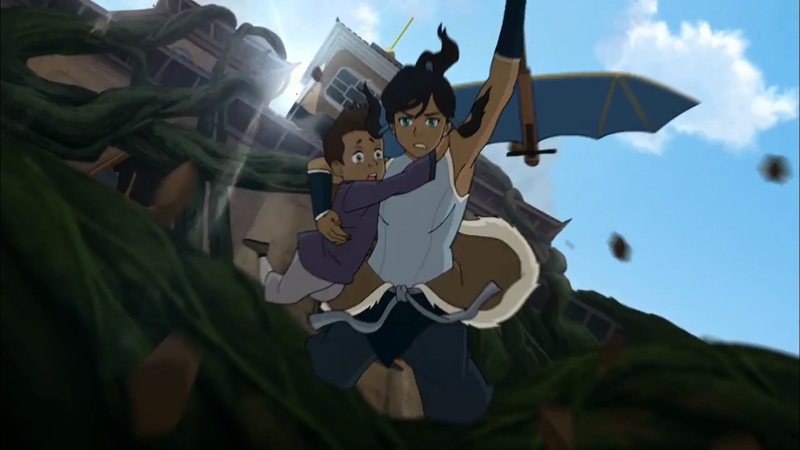 But she isn't going around fixing problems resulting from the events of Book Two, but rather Korra is helping the world adapt to these new changes. 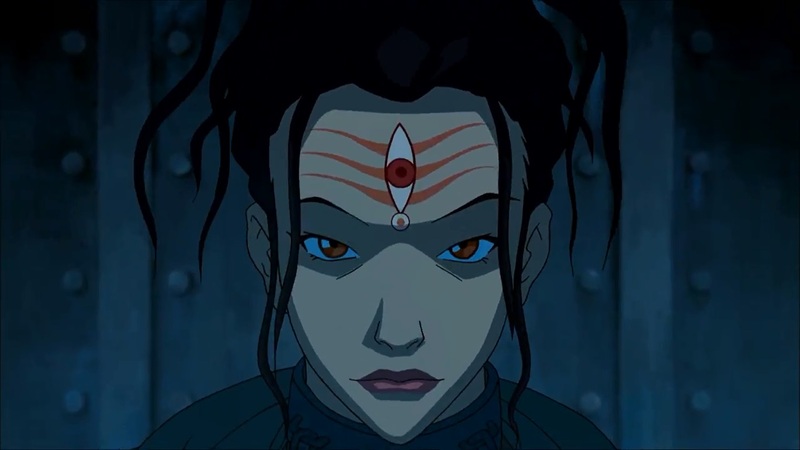 Even with the loss of her connection to the past Avatars, the show continues to recognize the roots of the series in The Last Airbender and Korra is becoming the more mature Avatar the world needs. Almost everyone gets a little screen time in these new episodes, including some new dangerous faces that do some very cool stuff with bending. The first two episodes, aired as one, were fantastic. Paced well with action, great art, and dialogue that uccessfully builds emotional weight and conveys character development. Unfortunately, because next week is July 4th, Nickelodeon decided to air the next episode immediately after the first block. Where the first one ended with a great reveal that left me excited to see what was next, the third episode is slower and ends at a point that wasn't too surprising. Now we're stuck waiting two weeks for a resolution to a problem that is difficult to invest in. Still, a continuing side plot for the series may be enough to keep the energy going over the holiday. 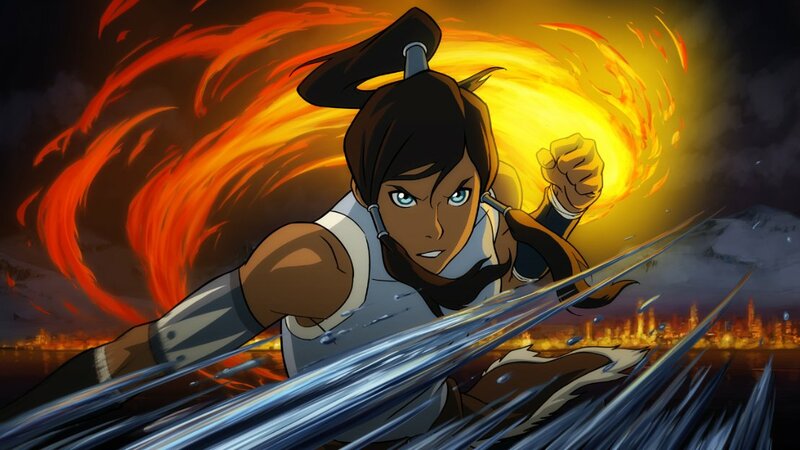 The Legend of Korra airs on Nickelodeon on Fridays at 8PM Eastern, but will take the week of the 4th off due to the holiday and return on July 11th. If you missed the premiere, the first two episodes will be rerun on Nick July 4th at 8PM. If you're further behind, Amazon Prime streaming has all of Avatar: The Last Airbender and the first book of Legend of Korra, with the rest available for purchase. Some episodes form Legend of Korra: Book One and Two are available on Nickelodeon's website, but it's a mixed bag. Now, on to the episodes! 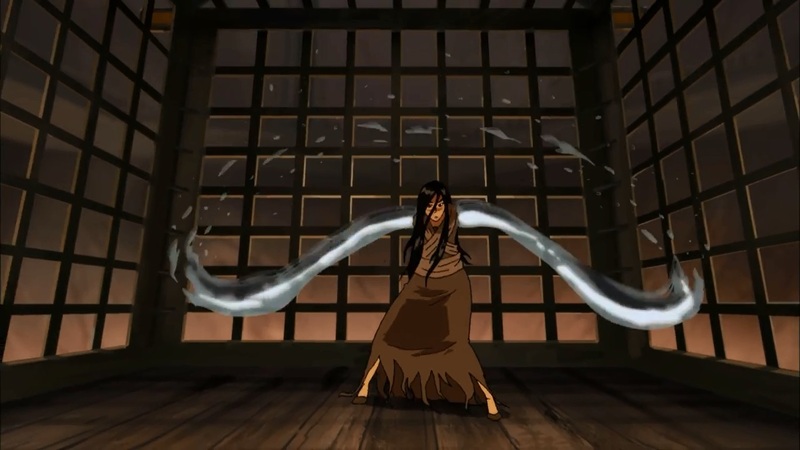 The two-part premiere of Book 3, "A Breath of Fresh Air" and "Rebirth," begins by showing the effects of Korra's decision to keep the portals between the mortal and spirit worlds open. 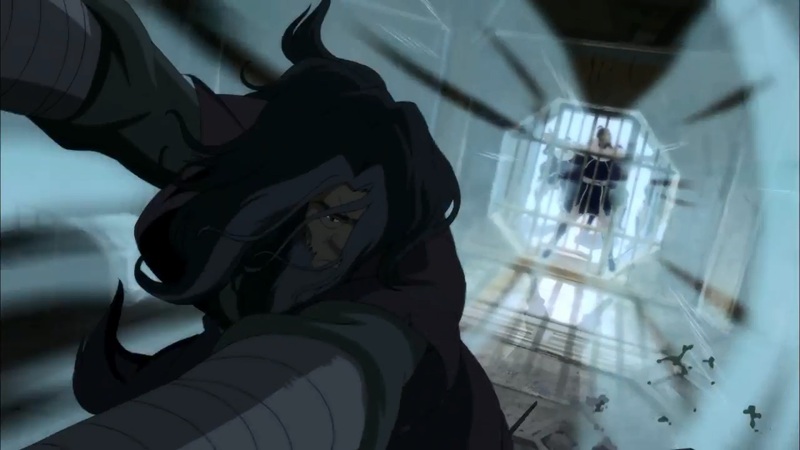 Bumi, brother of Korra's mentor Tenzin and son of Avatar Aang, is goofing off with one of the spirits when he discovers he can airbend. This is a surprising revelation since he has never been able to bend any of the elements and there are only five airbenders in the world. At first, Korra, Tenzin, and the rest of the group think perhaps Bumi is just a late bloomer, but that changes after a visit from Lin Beifong, chief of police and daughter of Toph, and Mako, Korra's ex-boyfriend and police officer. Apparently, there is another person in Republic City that is airbending. The president of the United Republic of Nations is already stressed out from the repercussions of Korra's actions during Harmonic Convergence. Not only is Republic City covered in vines that are forcing people out of their homes, but now there's an airbender causing trouble. Korra finds the airbender, a merchant named Daw, at the top of a bridge and calmly talks to him, relating to him over the bad day they're both having. This is a huge change in Korra compared to her attitude in the past. She is collected and peaceful rather than angry and impatient, taking the time to understand Daw and offer him help, instead of just getting frustrated that he doesn't understand her right away. This is reflected earlier in the episode as well, when Tenzin finds Korra meditating over how to address the issue of the vines in the city. 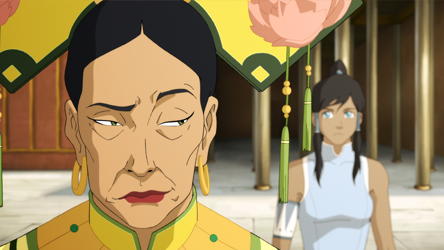 Daw agrees to train as an airbender with Tenzin and Korra, but then the president arrives, furious at the turmoil and damage caused by Korra's actions during Harmonic Convergence. He banishes her from the city and Korra happily accepts. Now, Korra understands her true path, to find the new airbenders across the world and rebuild the Air Nation. Thanks to a new airship provided by Asami and a map of reported airbender sightings from Mako, Korra begins her journey. 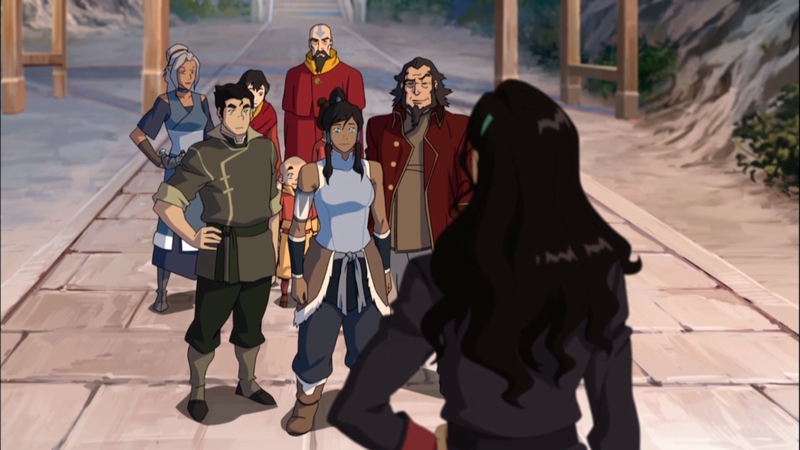 Joining her is Tenzin, Jinora, Bumi, Asami, Bolin, and a reluctant Mako, who is reminded by his brother Bolin that this journey offers chance to reconnect with their family in the city of Ba Sing Se. Mako's initial reluctance is echoed by his awkwardness with Korra and Asami. 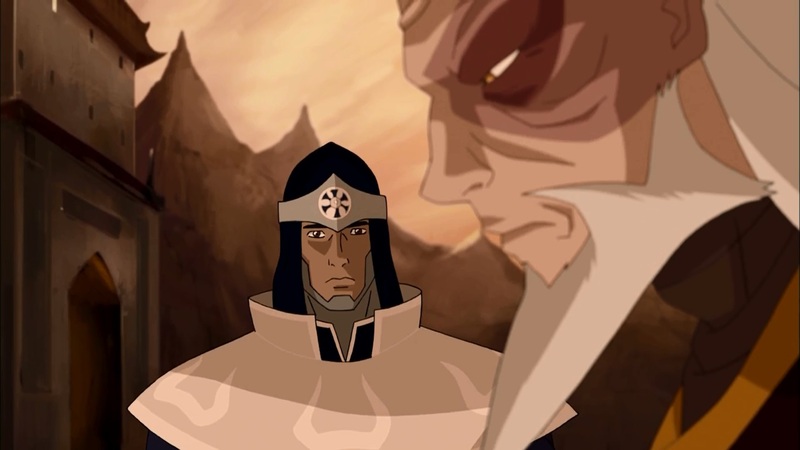 He's been in rocky relationships with both of them, most recently going through a final break up with Korra at the end of Book Two. Korra and Asami, however, are becoming better friends. 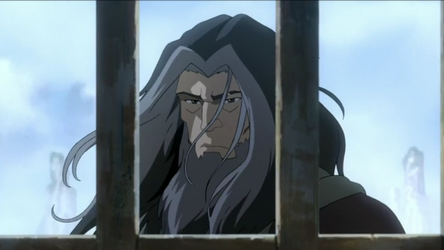 While Asami tries to teach Korra to drive, they discuss Mako's strange behavior lately and their knowledge of his infidelity during their respective relationships. They recognize Mako's kind of a jerk, but Korra and Asami still like him as a friend and, more importantly, value their friendship with each other.